Illinois corporations are governed by 805 ILCS 5 Business Corporation Act of 1983. The rules and regulations provided by the Illinois Corporations Act must be followed to maintain the corporation in accordance with Illinois State law. To form a corporation in Illinois, there are several statutory requirements that must be met. Our Chicago corporate lawyers know the law and handle all of the steps to insure your corporation is thoughtfully organized, properly incorporated, and recognized by under Illinois state law. 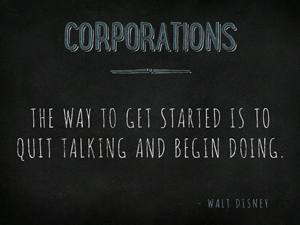 First, a business must establish a corporate name. The name must contain the word “Corporation,” “Company,” “Incorporated,” “Limited” or an abbreviation of any of these. The corporate name must be distinguishable from other domestic or foreign corporations authorized to conduct business in Illinois and the name cannot be one that is reserved, registered or is pending registration. The corporate name must not contain a word or phrase that indicates it is organized to conduct the business of insurance, assurance, indemnity, acceptance of savings deposit, banking or corporate fiduciary. Addiitonally, it is important for a business owner to understand that although the corporate name may be available on the Illinois state business registration database, it does not mean that another business entity may hold a federal trademark registration in the proposed corporate name. The corporation must also draft and file the Articles of Incorporation with the Illinois Secretary of State; this is how corporations are technically established in Illinois – there are other corporate formalities that must be addressed to ensure the corporation is maximizing the limited liability the corporate form offers business owners. The Articles of Incorporation must include the corporate name and address; the purpose of the corporation; the name and address of an agent for service of process procedures; as well as the number of shares the corporation is authorized to issue and the consideration the corporation will receive for these shares. The appointed registered agent agrees to accept legal papers on the corporation’s behalf if it sued. The agency may be a person residing in Illinois, or a domestic or foreign corporation that is authorized to do business in the state, that agrees to accept service of process on the corporation’s behalf. The next step is to develop and establish the corporate record book in which all of the corporation’s important records, agreements and documents are kept, such as minutes of director and shareholder meetings, stock certificates, and bylaws, shareholder agreement, shareholder management agreement, corporate buy-out agreement, subscription agreement, etc. The record book is required to be kept at the corporation’s principal office. An entrepreneur looking to incorporate a corporation must also prepare corporate bylaws. A corporation’s bylaws are an internal document, not publicly filed with the Secretary of State, which sets out the operational rules and regulations for the corporation. The “Incorporator” of a business, the individual that signed the articles of incorporation, appoints the corporate directors who will initially serve on the board until the first annual shareholders meeting – at which time, the shareholders will elect the next term’s board members. The “Incorporator” must fill in the “Incorporator’s Statement” disclosing the names and addresses of the initial board of directors. The executed statement is kept in the corporate records book discussed above, and need not be filed with Illinois State. After forming an Illinois corporation, it is critical to maintain the business in compliance with the law. The corporate statutory requirements are also vital in the preservation of the limited liability status a corporation provides its owners. Our Chicago corporate lawyers counsel our clients through the incorporation process and offer services to maintain the status of the corporation. A corporation must also appoint corporate officers. This is done during the first board of directors’ meeting. During this meeting, besides appointing corporate officers, the board adopts the bylaws, selects a corporate bank, authorizes the issuance of stock, sets the corporation’s fiscal year, and adopts an official stock certificate form and corporate seal. The Incorporator, or one of the directors, records these actions in the corporate minutes. If the corporation will be an S corporation, the directors should approve the S corporation status during this first meeting. An S corporation is a special type of corporation created through an IRS tax election that, if eligible, can avoid double taxation to the corporation and again to the shareholders by electing to be treated as an S corporation. The issuance of stock is a critical step in the formation of a corporation. Corporations issue stock to the shareholders, and, even though not legally required, small corporations tend to issue paper stock certificates. Each shareholder’s name and contact information are entered into the corporation’s stock transfer ledger. Note that a corporation’s share of stock is classified as a security under Illinois and federal securities laws. Securities laws regulate the offer and sale of stock. Small corporations are usually exempt from these laws by state and federal governments. Corporations conducting business in Illinois must also file an annual report with the Secretary of State, due on the corporation’s anniversary date or a late filing fee is imposed. Along with complying with Illinois annual report requirements, corporations must also comply with other tax and regulatory requirements. State tax identification number: Illinois requires a state tax identification number as well. Business licenses: depending on the type of business conducted and the location of the corporation, additional local and state business licenses are required).